Hey, there, everyone! 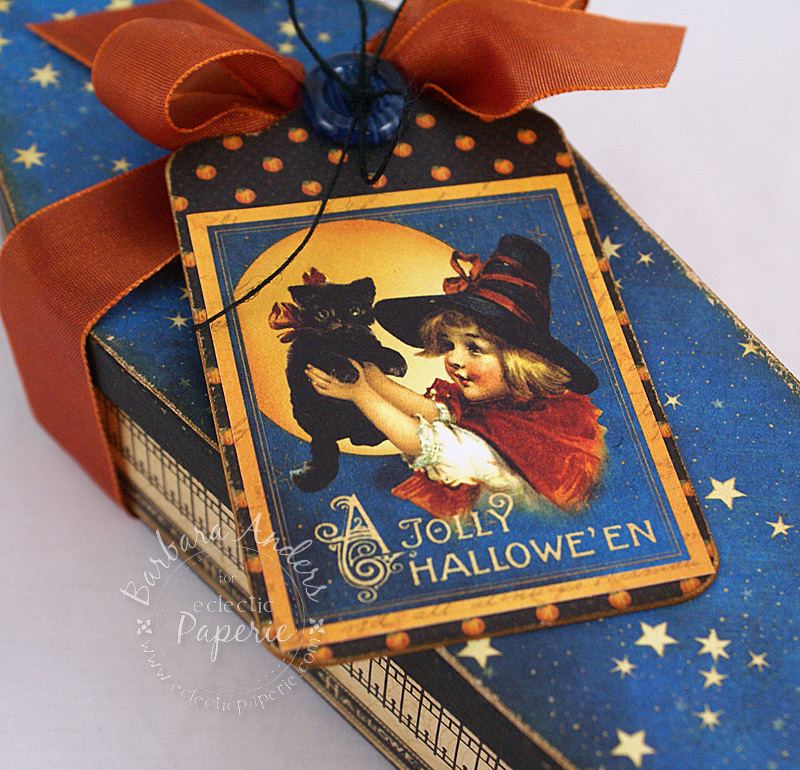 I’m here today with a darling little treat box that is just as easy to do as it is CUTE! This project uses Graphic 45’s Happy Haunting and I do believe it’s one of my favorite Halloween papers ever. It has such pretty colors and adorable images. OK, now, this project is super simple and no stamping! But I just love how it turned out. 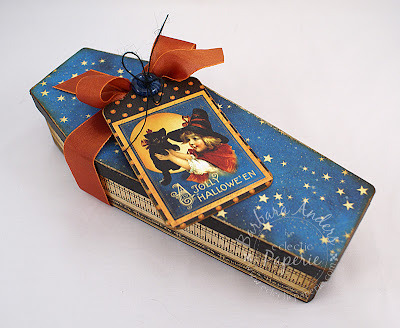 I was in a craft store several weeks ago and spied these paper mache' coffin boxes so I picked one up. It was only $1 so didn’t have much to lose, but, you know, you never know, right? ;-) So, suddenly it occurred to me that my gorgeous Happy Haunting paper would really work well to cover this box PLUS make a matching tag. Voila! Instant giftie! First, I painted the whole thing with black craft paint. Then I used some paper with a fence design around the sides and a clock at each end, and a starry sky pattern for the top. 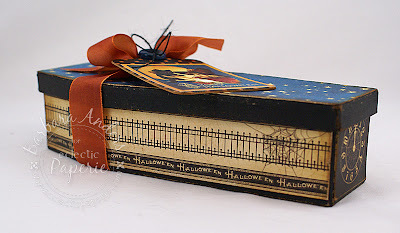 I did lots of distressing with my Tim Holtz Idea-ology Sanding Grip Block and then distressed the sanded edges and corners with Vintage Photo Distress Ink. Then I made a tag with more patterned paper, tied a ribbon around, tied on the tag with some twine and a button from the Ice collection, and it was done! Who knew a coffin could be so cute! Thanks so much for stopping by! Oh my goodness Barbara...this is pure genius! LOVE it! This is SOOOOOOOOO AWESOME!!! That is all. wow...this is soooo stinkin' cute!!!! !